This is a pair of ElectroShot 1:8 Buggy Tires. The ElectroShot comes from the mind of Ty Tessmann and is designed to perform just like a Hole Shot 2.0 while lasting significantly longer. As the name suggests, the ElectroShot is combination of Pro-Line’s Electron and HoleShot tread designs with connected bars in the center where the heaviest tire wear occurs and Holeshot pins everywhere else for maximum traction. 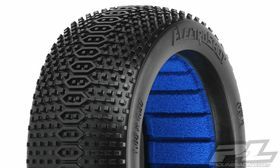 Connected bar-type tires like Pro-Line’s new Positron have become the new standard for 1:10 buggy race tires but pins are still the king of the 1:8 Off-Road. The ElectroShot begins to bridge that gap and test the waters with a hybrid Bar and Pin tire. Racers who have tried the ElectroShot say that it feels similar to a HoleShot but has even better forward grip! Be the first to try out the future of 1:8 Race Tire Design with Pro-Line’s new ElectroShot!